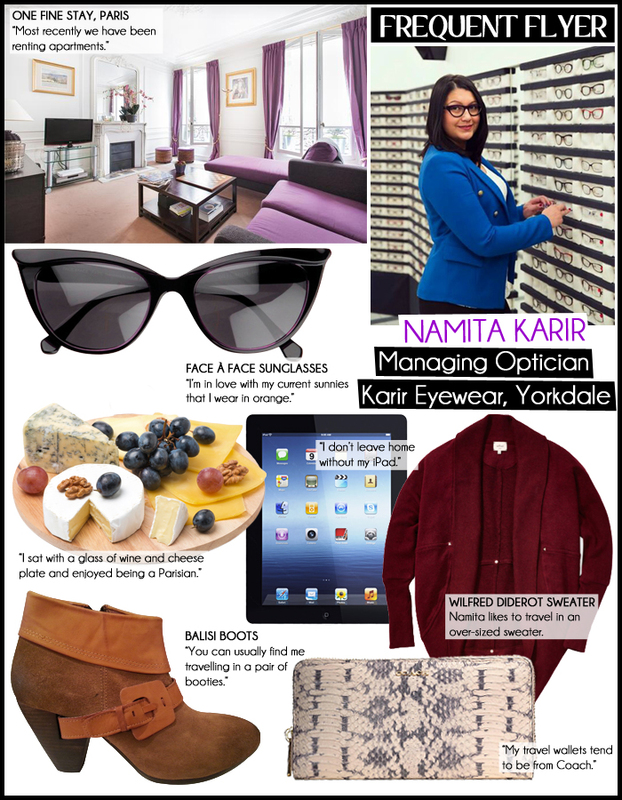 As a buyer for her family’s optician store, Namita travels regularly to Europe scouting out the latest fashions. As the Managing Optician at her family’s optical store, Karir Eyewear in Yorkdale Shopping Centre, Namita Karir spends her day fitting customers with the perfect pair of glasses (or sunglasses!). When she’s not in the mall, chances are you’ll find Namita travelling. 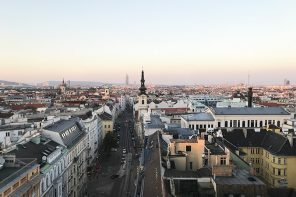 “I get to travel to Europe for Eyewear Expos where I get to see the latest fashions and pick out new products for our three locations,” says Namita. Aside from her business travels, Namita tries to squeeze in time for pleasure too, having just returned from a trip to the Dominican Republic and a buying trip to Paris. Where do your buying trips take you? Tell us about your last trip and a highlight for you. The buying trips take me to Milan, Paris and NYC for now. There are many expos around the world but these three tend to be the biggest for us. My most recent trip was to Paris. The highlight of this trip was taking a few hours to enjoy the Eiffel Tower at night. I sat on a patio with a glass of wine and a cheese plate and enjoyed being a Parisian and letting the world pass me by. The last destination you visited — share one thing a first-timer must do? Most recently I was in Puerto Plata, Dominican Republic. Good tip — take a water bottle with you. You need to stay hydrated! Most recently we have been renting apartments. It has been great having a larger space and a kitchen! Making your own breakfasts is a great way to save calories and live like a local. Seems silly, but fruit and pastries in Paris were delicious when enjoyed in the comfort of our own apartment. 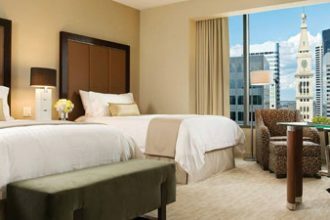 Do you collect travel reward miles/points? If so, what program do you use and have you used it to redeem anything? I always say if you’re going to spend money on your Visa you might as well get something back for it! I collect Aeroplan miles and have taken a girlfriend with me to NYC and have visited my Grandmother in Victoria B.C. I plan to use my miles to go to Newfoundland next for a destination wedding. I have a great leather tote that I picked up from Winners with a big crystal buckle, a Victoria Secret “Pink” bag and I recently purchased a bag in a small shop in Paris. I have pieces to choose from. My travel wallets tend to be from Coach. My iPad/iPod, a good book and snacks. I always get the munchies when I’m travelling. I don’t leave home without my iPad. It keeps my schedule, maps and camera all at my fingertips. Favourite part about travelling/least favourite part about travelling? Travelling inspires me. I enjoy the architecture, window shopping and food/wine. My least favourite part is leaving behind the comforts of home. Most memorable meal. Where and what did you have? I have to have my Veal Milanese whenever we are in Milan. Its such a simple thing but it’s just done right when your there. I took My Sister’s Keeper with me on my last trip. Dallas Green/City and Colour gets me through my trips. But you can also find Mumford and Sons, The Lumineers, John Legend’s latest and The Weeknd on my playlist. Lush’s “Full of Grace” moisturizing bar is the only thing I put on my face. Keeps me hydrated. Sunglasses you are currently loving right now? As you can imagine I have a few to choose from… but I’m in love with my current Face À Face Cat Eye sunnies that I wear in orange. Tell us what your airplane style is. You can usually find me travelling in a pair of booties that I bought from Balisi, a pair of leggings, a comfy t-shirt and an over-sized sweater (probably from Wilfred). It’s sort of silly but I collect glasses from Hard Rock Café’s in a few places that I’ve been to (Vegas, Aruba, NYC etc.). When you have a drink with them you get to keep your collectable glass and it has the city name on it. It’s a re-usable souvenir. Where was your last vacation? Who did you travel with and what was the best thing you did? The beginning of December my sister and I went to Puerto Plata, Dominican Republic and it was quite lovely. The best thing we did on that holiday was travel by cable care to the top of mountain named Isabel. The car takes 10 minutes to climb the view from up there was amazing! There is a LONG bucket list but my absolute dream vacation is an island hopping tour in Greece. My travel agent says I need to book it about a year in advance and I’m just looking for the time and right travel companion!